My kids have been out of school for one day(ONE!) and I'm already trying to figure out if we have enough activities planned. We are all in luck because Lego is having their Summer Brickation event at Broadway at the Beach, 1112 Celebrity Circle, Myrtle Beach, S.C. The Summer Brickation will last from June 6th through July 17th. Several stations are set up to give your children a chance to exercise their creativity with Lego. I love the beautiful Lego sets you can buy, but I love the opportunity for my kids to use their creativity more. Lego also has several large Lego sculptures for photo opportunities. 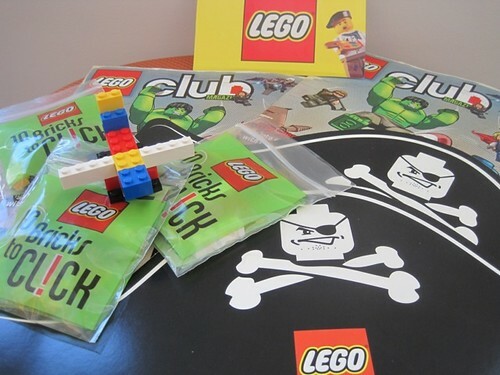 a Lego Club Magazine, 10 bricks to click(a pack of 10 bricks with building instructions) and a pirate hat. Entry could not be easier. Leave a comment below to enter. For an additional entry, you can follow my blog via email or RSS. Just leave me another comment to let me know you are following. The contest will run through June 18th at noon. I will choose the winner using random.org. You have 24 hours to respond or I will choose another winner. Good Luck and Happy Building!